The influence of Middle Georgia State University students, alumni and faculty is all over a seasonally fitting fine art exhibit scheduled for downtown Macon. "Dysphoria: An Exhibition" takes place from 6 p.m. to midnight Friday, Oct. 21, at the 567 Center for Renewal at 456 First Street. "I'm really excited about this show," said Shannon Riddle, lecturer in art for MGA's Media, Culture and the Arts department. "Dysphoria is unique in that it was contrived and organized by mostly University students and alumni. This show reflects the talent and drive of MGA artists and their collaborative vision to contribute to the ever-growing arts community in the Middle Georgia area." Dysphoria was designed by and features the art and artists of the Ocmulgee Artist Guild, a Macon- based collective of individuals ranging from formally trained students and professors to instructors and patrons of the arts. The exhibition will unveil original artwork from over a dozen talented guild artists. Current MGA students involved with the show in various capacities are Alexandra Johnson, Wes Davis, Jenna Jacobs, Rachel Podwolsky and Brooke Scott. Alumni taking part include Colin Penndorf (567's fine art director), Jessica Whitley, Eddy Grimm (Eddie Bryant) and Thomas Heald. Riddle is one of the organizers, as is former MGA art faculty member Charles Ward. "The idea behind Dysphoria is simple," Riddle said. "It's a show centered around the idea of fear and uneasiness near the end of October, but the strength of the exhibition will be the different student interpretations of the concept without having to worry about turning the work in as an assignment, in addition to the attention the space will get for hosting such a display." 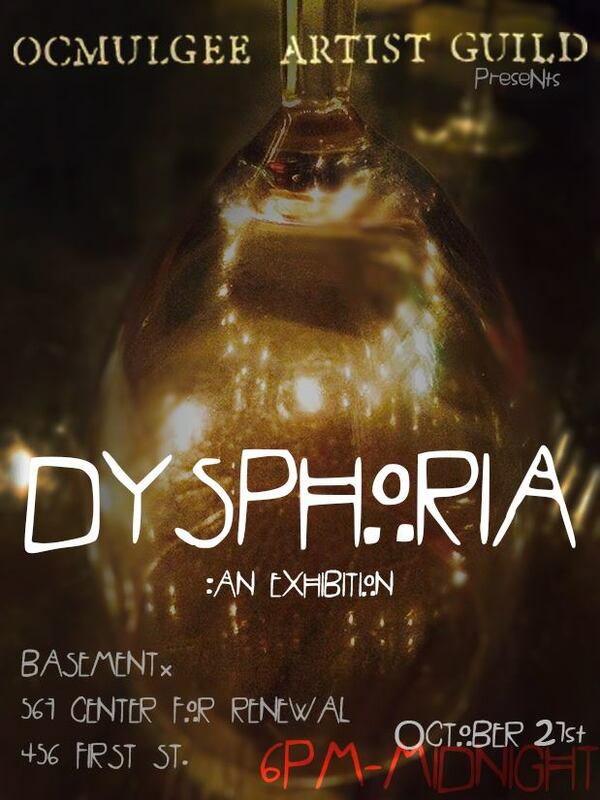 Though based around the theme of dysphoria, the event will feature an array of fine work available for purchase. Proceeds through art sales and donations will go to the Ocmulgee Artist Guild. Attendees are welcome to wear Halloween costumes. Admission is free. For more information, contact the center at (478) 238-6051.